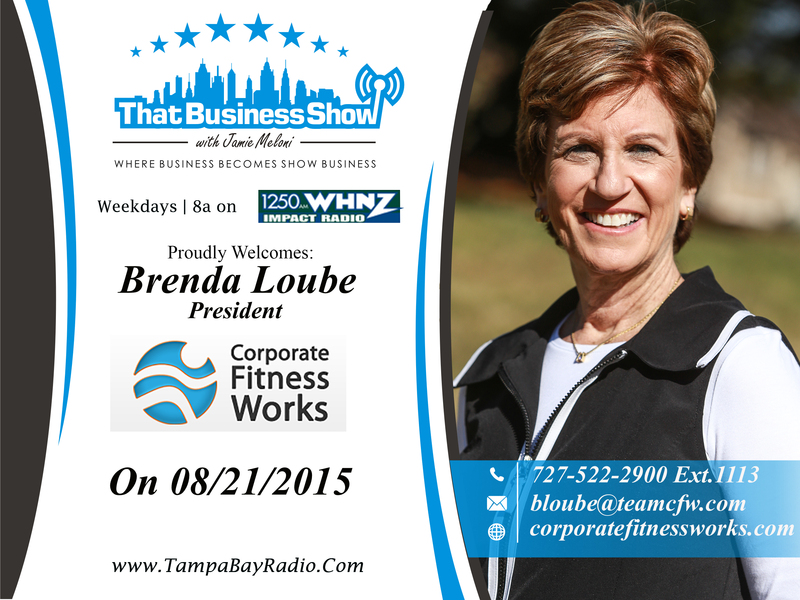 Today on #ThatBusinessShow with Jamie Meloni on 1250whnz at 8am, we had quite the full show! 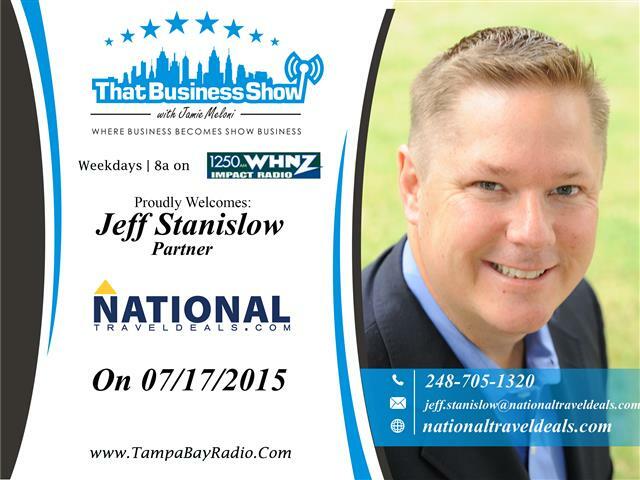 #ThatBusinessShow is on 1250whnz every weekday at 8am, or on http://www.tampabayradio.com. Check out the video of the show on http://www.youtube.com/jamiemeloni. Joining us today was JJ Roberts from Tampa Bay Innovation and Tech Garage, a business focused on helping entrepreneurs grow their businesses with technology. Also joining us was Todd DeLozier, president of Meridian Security, a security agency dedicated to their customers. 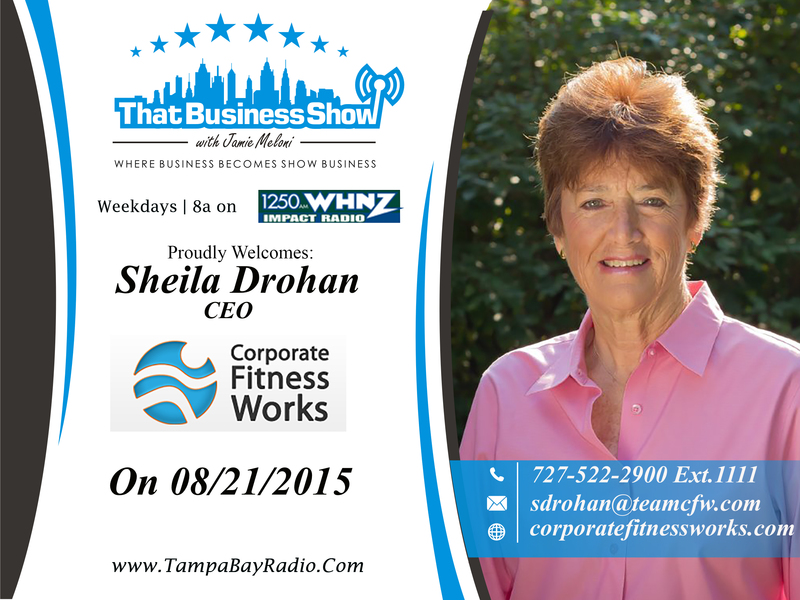 Our last guests were Brenda Loube and Sheila Drohan from Corporate Fitness Works, a Certified Woman Owned Business dedicated to bettering the health of the employees of their client businesses. A full show today for #ThatBusinessShow with Jamie Meloni! 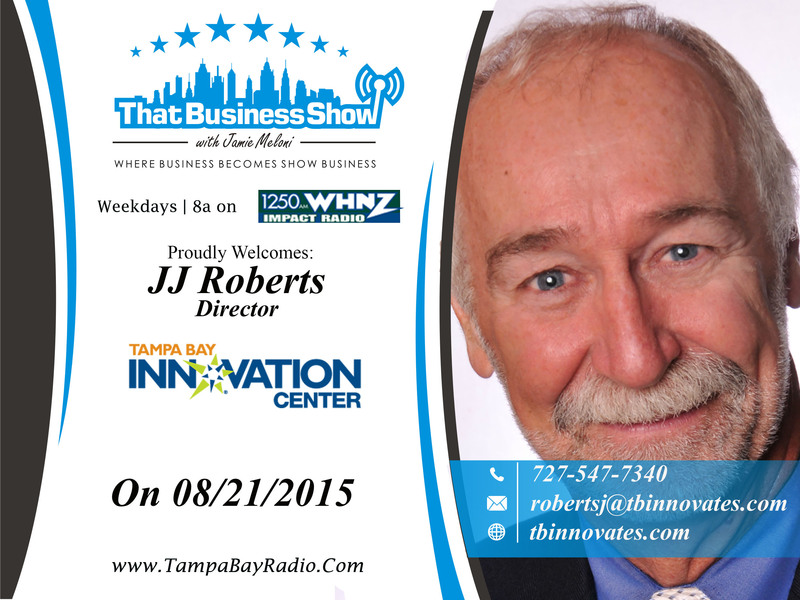 On the first segment, we had JJ Roberts from Tampa Bay Innovation and Tech Garage. JJ Roberts is a serial entrepreneur, using Tech Garage to help inexperienced entrepreneurs start up their businesses with three successful technology startups to his credit. On the show, he spoke to us about how he directly assisted over 20 young startup companies and worked with numerous additional entrepreneurs and their technologies at the earliest stage of conception. He is certified as a Professional Business Coach and has served on the Board of Directors for the Georgia Tech Business Network. He told us how he holds classes and even hosts businesses in his Tech garage location at 244 2nd Ave., North – Suite 9, St. Petersburg, 33701. He spoke to us about his different levels of assistance for people wanting to expand their businesses. To learn about all of his different business packages and opportunities, contact JJ Roberts at 727-547-7340 or at robertsj@tbinnovates.com or visit his site at http://www.tbinnovates.com. Also joining us was Todd DeLozier, president of Meridian Security, a security agency dedicated to their customers. 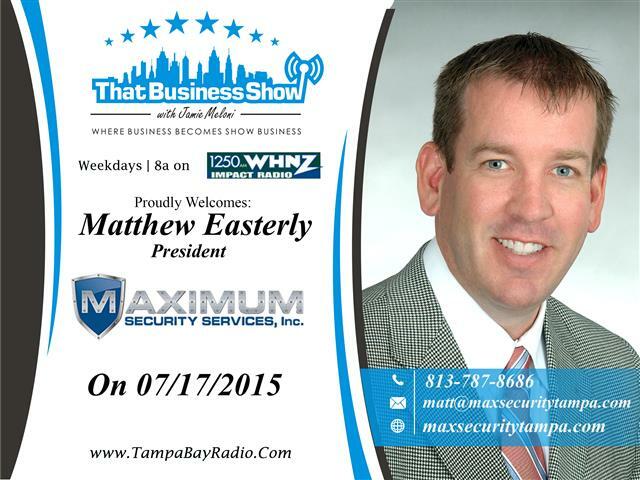 He told us about the obstacles that he faces in his industries, and explained to us why his business is different than any other security agency in Tampa Bay. 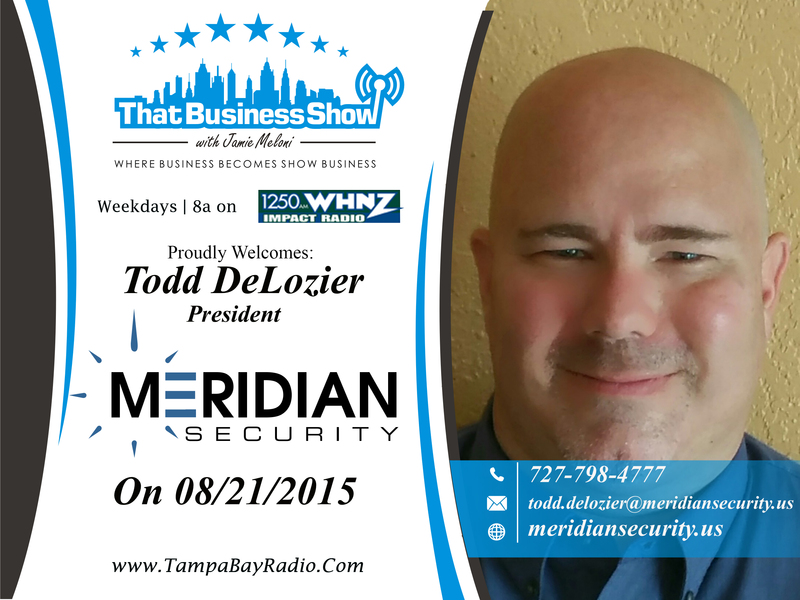 “Being personally connected to our customers and being there for them, never growing too big to stay out of touch.” To get more on Todd, contact him at 727-798-4777 or at todd.delozier@meridiansecurity.us or his website at http://www.meridiansecurity.us. Our last guests were Sheila Drohan, Co-founder, owner and CEO of Corporate Fitness Works; and Brenda Loube, Principal and Co-Founder of Corporate Fitness Works. They described to us how Corporate Fitness Works is Certified as a women-owned business through the Women’s Business Enterprise National Council. They explained to us how they provide comprehensive wellness and fitness programs for corporations. Proud of promoting health in the community, you can find out about more about Sheila and Brenda and Corporate Fitness Works at http://www.corporatefitnessworks.com. Contact Sheila at 727-522-2900 ext. 1111 or at sdrohan@teamcfw.com. Also, you can contact Brenda at the same phone number, ext. 1113 or at bloube@teamcfw.com. Thanks for tuning into that #ThatBusinessShow with Jamie Meloni at 1250whnz every weekday at 8am, or on http://www.tampabayradio.com. Check out the live footage on my YouTube channel at http://www.youtube.com/jamiemeloni.